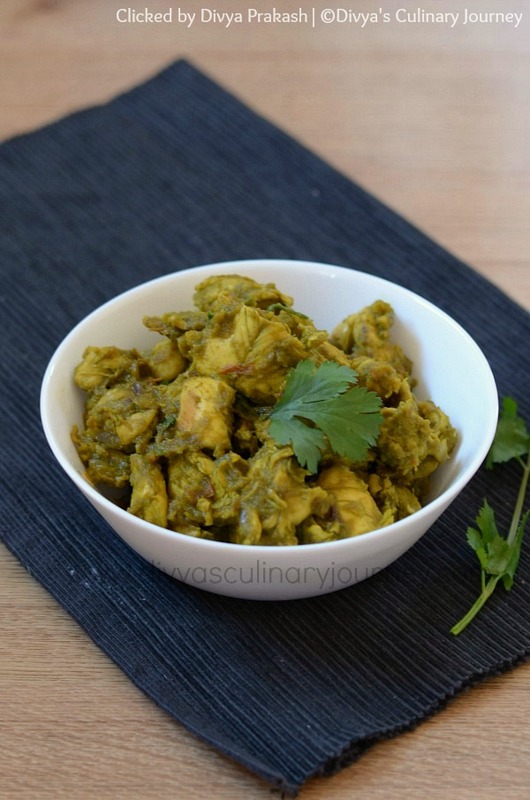 Today I am sharing Cilantro Chicken Curry recipe. It is nothing but cilantro flavored Chicken curry. This is a very simple recipe without much spices. Suddenly I started craving for the flavor of cilantro a lot. I remembered tasting cilantro flavored chicken in friend's place. But she was a little busy, so couldnt call her for recipe . so decided to give a try in my own version. It came out very well. Grind the ingredients listed under 'to grind' fine paste. In a pan, heat oil then add cumin seeds and when they crack add chopped onions, saute till they are translucent. Then add tomatoes, let it cook for 2-3 minutes and the ground cilantro paste along with turmeric powder and cook till the raw smell is gone. Now add chicken mix well and cook. Chicken will release water. So check and if required add water. Let it simmer for 15 - 20 minutes. When the oil starts seperating, turn off the stove and Serve it warm. I have used boneless chicken. You can chicken with bones too. I have added green chillies. If you want you can add chilli powder too. Looks gr8! Something my hubby would love im sure :-) Thanks for sharing this on my space! 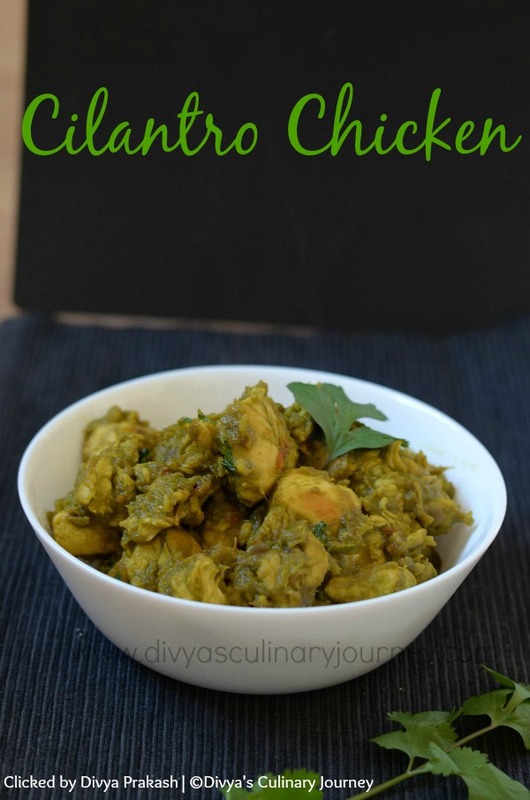 I love cilantro too, never made cilantro the main flavour for chicken curry though.. will try..
Love this chicken,flavorful and so tempting. I'm one of those people that just can't handle cilantro. I bet I could sub basil for this dish and it would be wonderful. Wow! What a delicious curry paste you made with ginger and cilantro in it! A must-try! I can tell this dish is just bursting with amazing flavors. Can't wait to try it! cilantro, chicken, and curry are three ingredients that I LOVE hearing together!! This sounds amazing! Yummy flavorful chicken dinner! it looks pretty easy too! Thanks for the addition to my recipe box. Yummed and Pinned! 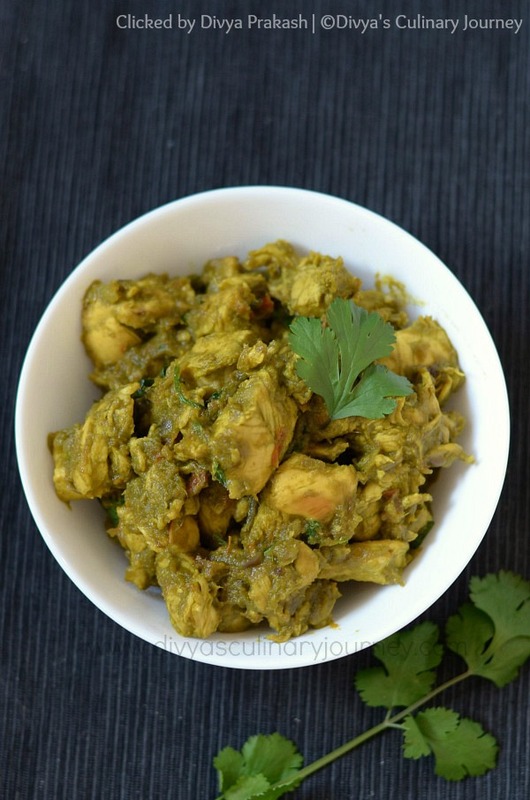 I love easy, tasty curry recipes! Yum! Looks delicious. I love cilantro. I love cilantro! This looks so delicious. Turning cilantro into a paste is genius. 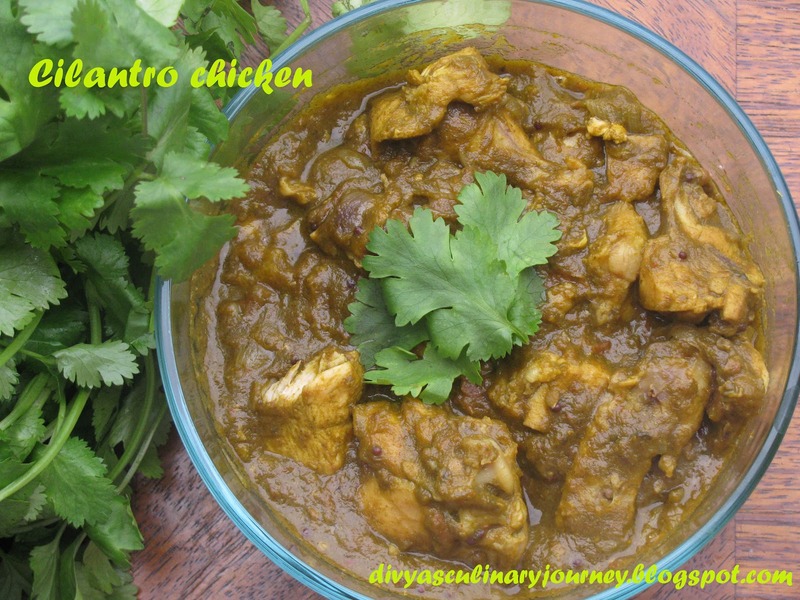 What a delicious chicken divya..
LOVE cilantro, I can't wait to make this! What a tasty looking recipe - a proper comfort food dish, this! SO many wonderful ingredients and flavors in one bowl! Great recipe, it looks so tasty! This sounds so full of flavor and I love cilantro, so this will be a great dinner soon!